For those of you who romanticize travel and long for the days of civilized airports, airlines with glamorous stewardesses, ocean liners with formal black tie dinners and train travel on the Twentieth Century (which I actually experienced), then you will probably be pleased to learn of the new book, coming out on December 1, just in time for the holidays, Louis Vuitton: 100 Legendary Trunks. As most of you know, Vuitton was founded in 1854 when the original Louis opened his first store in Paris. He made history with the creation of his first trunk which had a flat top and could be stacked as opposed to previous trunks which had barrel shaped tops to aid in the dispersion of water. Believe it or not, the classic monogram canvas, by George Vuitton, son of Louis, was created in 1896 – seems so modern for that era. Aside from any of the other associations we make with the brand, Louis Vuitton has always been associated with travel. With the advent of increased methods of transport in the mid-19th century, Vuitton filled a void for travel accessories that would satisfy every need. The book is illustrated with 600 images taken from the Vuitton archives as well as new ones created especially for the book. Here is the very appealing video Vuitton made as a teaser for the book. One of the most active customer bases in Vuitton history had to be the Maharajas of early 20th century India, particularly the Maharaja Hari Singh of Jammu and Kashmir (ruled from 1925-61). Princes of the British Raj led extravagant and opulent lives and were obsessed with western luxury goods. 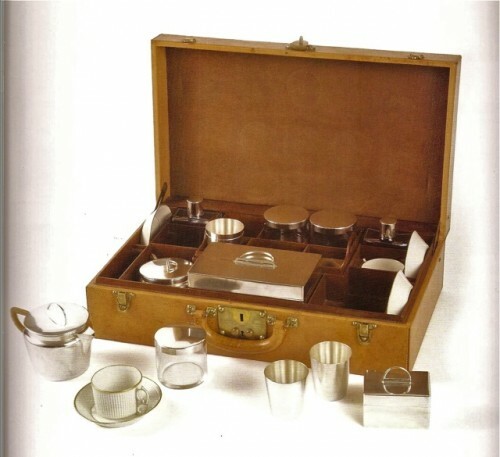 In addition to his purchases from Vuitton, this Maharaja also ordered for example, sixty picnic baskets from Hermes (as gifts) and monogrammed and crested wooden boxes from Harrods to present his trout in. His taste for Louis Vuitton was however unparalleled. Here are a few examples, all taken from Made for Maharajas by Amin Jaffer. 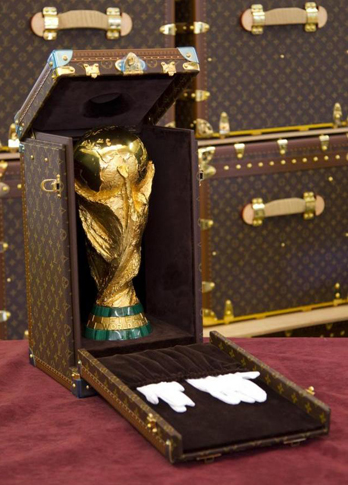 Now each year, Vuitton produces about 400 custom trunks such as the one below that was made to hold the solid 18k gold trophy for the World Cup as it traveled to South Africa this year. Although the case is lacking the traditional LV monogram, it does have Lagerfeld’s initials on the top in front of the handle. So how do you think he got that through security at the airport? Just kidding. But for those of us who do indeed have to deal with the security lines at the airport, we can still reminisce and imagine the genteel days of trunk travel through this lavish new publication. This entry posted in books, fashion, history, louis vuitton, travel. 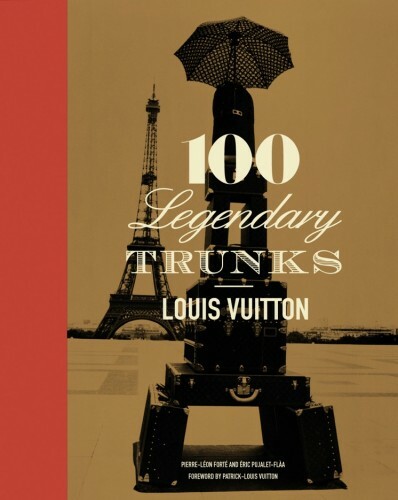 Entry Tags: Louis Vuitton Trunks, Louis Vuitton: 100 Legendary Trunks, Luxury Travel, Made For Maharajas Bookmark the permalink. Thank you, again, for another fabulous post. I continue to be intrigued by not only your topics, but the beautiful presentation. I fear, though, that my dedicated reading of your blog might lead me to poverty – I covet just about everything. Thank you Elle! 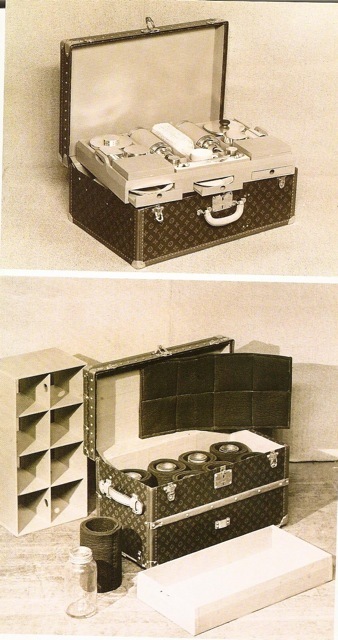 I love eveything also – perhaps someday a Vuitton trunk will be within reach. 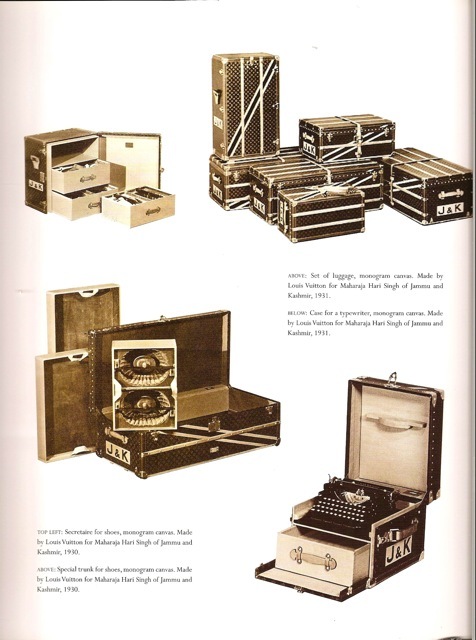 Several years ago, I had the honor of attending an exhibit in Paris of all the incredible LV trunks – and now I am seeing a return to this sort of glamour in design – I spotted a wonderful desk, at Restoration Hardware that reminded me of an old LV from the exhibit. I hope glamour returns to travel. Patricia – lucky you! Must have been a fantasic exhibit. Restoration Hardware would certainly be a more affordable choice. And as for glamour returning to travel – I think we’re all waiting. The film trailer for the book is my idea of graphic perfection down to the last detail. 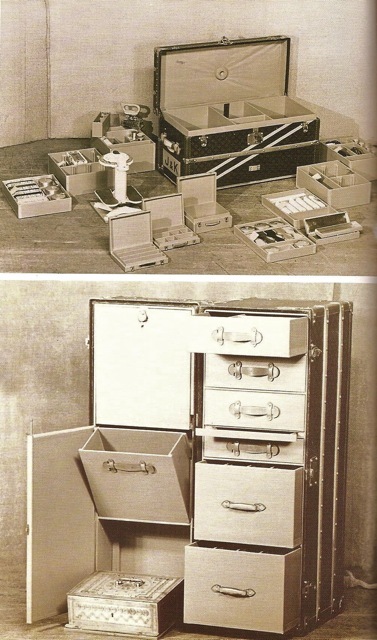 I had not realized Louis Vuitton produces such sumptuous custom ordered trunks and cases, or that they are credited with dreaming up the simple idea of flattening the tops so long ago for stacking them in transit. Given what one of their trunks costs today, I’d feel obligated to have it crated before I actually used it as a piece of luggage. Hi Harrison- yes, isn’t the trailer great? 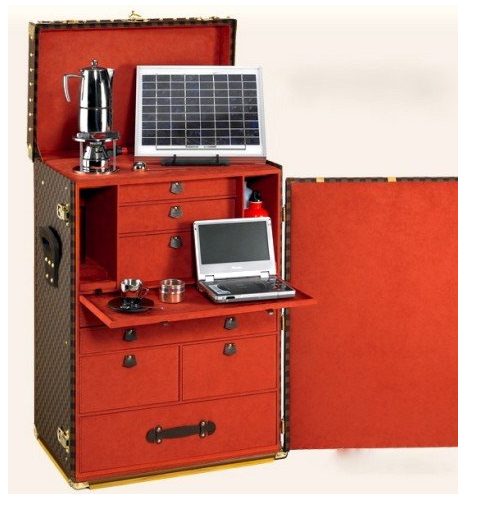 The trunks are amazing – they will work with you to create whatever you can imagine – at a price of course! 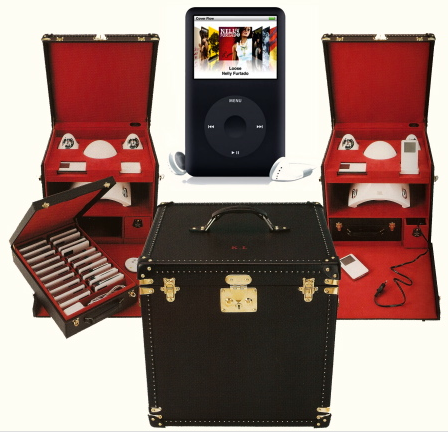 I wonder if I invest in a custom LV trunk, will I have anything left to travel on? 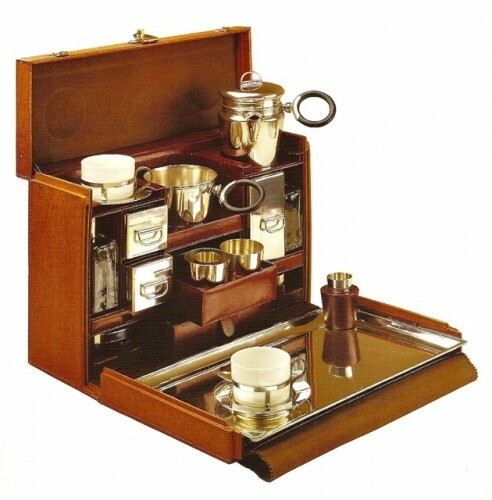 What gorgeous craftsmanship – functional and stylish all at the same time. I’m putting the book on my Christmas wish list! It’s going on my list too! 85 queries in 0.614 seconds.